Prickly Ash Bark is a traditional treatment for all common ailments caused by poor circulation, including leg cramps, varicose veins, cold hands and feet and the feeling of cold throughout the body. For almost a hundred years it was an official herbal medication in the U.S. and was recommended for a number of digestive disorders and rheumatism. By increasing the circulation it has been very helpful for those who are suffering from joint aches and the pains of chronic rheumatism and arthritis. The Native Americans used it to treat toothaches, itchy skin, gonorrhea and sore throat. It has been shown to have a very positive effect on the mucous membranes, which may help to fight off respiratory disorders. Prickly Ash Bark has a positive effect on the body's nervous system and is thought to improve fatigue which may be beneficial for the elderly and those who are in recovery from illness. A poultice or cream/salve can be applied to the skin for leg ulcers, cracking of the skin, skin eruptions and skin infections. Considered an "alterative" or herb, it may help to gradually and favorably alter the course of an ailment or condition.The herb is believed to enhance the process of nutrition and promote excretion which can restore normal bodily function, and it also acts to cleanse and stimulate the removal of waste products from the system. The U.S. Pharmacopoeia listed Prickly Ash Bark as an official treatment of physical conditions such as chronic rheumatism, flatulence, and diarrhea, beginning in the year 1820. It was further introduced to mainstream medicine as a treatment for cholera and typhus epidemics. And it has earned the name "toothache tree" because of its contribution to improving conditions of the teeth. Prickly Ash Bark extracts may help to stimulate circulation in the body and thought to be beneficial for a wide variety of physical conditions. It helps to eliminate abdominal chills, peripheral circulation to the hands and feet, and white fingers associated with Raynaud's syndrome. It is also said to provide relief for leg cramping, chilblains, varicose veins, varicose ulcers and lymphatic circulation. By promoting general blood circulation, it is also said to be beneficial for poor circulation that causes soreness or pain to the bones or joints. Prickly Ash is often used in combination with other natural remedies for rheumatoid arthritis. 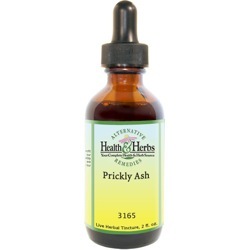 Prickly Ash is thought to be especially helpful in cases of muscle spasms and other arthritic complaints. It believed to stimulate the digestive system and is helpful in assisting the relief of dyspepsia, colic, indigestion and general stomach problems. Used to relieve flatulence and reduce belching and burping. It is considered to be a useful tonic in debilitated conditions of the stomach and digestive organs, including the liver. Considered a diaphoretic, it can increase perspiration and reduce intermittent fever. This action is helpful in ridding the body of toxins through the skin in the sweating process. This herb is believed to destroy microbes and worms, and fight off yeast overgrowth, Candida, cholera, gonorrhea, typhoid, typhus, and dysentery. Prickly Ash Bark has been used historically for its benefits on asthma, colds and sore throats. It has been used help to control diarrhea. By using this herb, you should see improvement in hemorrhoids with continued use. The bark is thought to help relieve sores in the mouth and ease the pain of a toothache. It has been used for paralysis of the tongue, and paralytic conditions of the vocal chords. Ingredients: Prickly Ash Bark, Structured Water, 20% Alcohol. Non-Alcohol: Prickly Ash Bark, Structured Water, Vegetable Glycerin. Contraindications: Pregnant and nursing women should not use Prickly Ash Bark, nor should those who experience stomach inflammation or intestinal ulcers. Use of Prickly Ash Bark may cause one to become more sensitive to sunlight and burn more easily.